Egyptian ethnomusicologist Mina Girgis and Ethiopian American singer Meklit Hadero are joined by musicians who live along the world’s longest river for a boundary-crossing evening of new music. The Nile Project, inspired by Yo-Yo Ma’s Silk Road Project, hopes to spread the musical traditions of the 11 countries touching the Nile, using music to raise awareness for the area’s environmental and cultural challenges. The group’s first recording, Aswan, was named one of NPR’s Top Five Must-Hear International Albums of 2013. Funded in part by the Expeditions program of the New England Foundation for the Arts, made possible with funding from the National Endowment for the Arts, with additional support from the six New England state arts agencies. Sponsored by the Performing Arts Series, with additional support from the Arts Council,Mahaney Center for the Arts, the Environmental Studies Program, the Dance Program, and the Department of Music. A free reception will follow the concert in Crossroads Cafe, adjacent to the performance space. 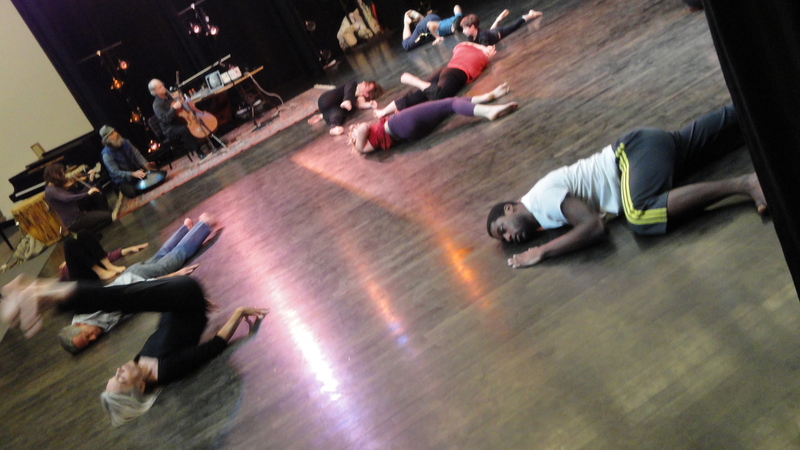 The Nile Project at Middlebury will consist of a suite of lead up events in February and March 2015, and culminate with a residency and the above performance by the Nile Project artists in the first week of April. All events are free, except the ticketed performance on April 2. Pre-concert talk: "Music of Africa"
Presented by ethnomusicologist and Assoc. Professor of Music Damascus Kafumbe and Kinobe. Presented by Nile Project ethnomusicologist Mina Girgis, Middlebury Professor of Geology and Environmental Studies Pete Ryan, and Mike Winslow of the Lake Champlain Committee. Part of the Howard E. Woodin Environmental Studies Colloquium. Presented by Female Nile Project musicians will lead a discussion with Professor Baker-Medard's Gender, Health, and the Environment class. Open to Middlebury College students only. The Nile Project is transforming the Nile conflict by inspiring, educating, and empowering an international network of university students to cultivate the sustainability of their ecosystem. The project’s model integrates programs in music, education, dialogue, leadership, and innovation to engage students across disciplines and geographies. Musical Collaborations: The Nile Project brings together artists from the 11 Nile countries to make music that combines the region’s diverse instruments, languages and traditions. The concert experience aims to inspire cultural curiosity, highlight regional connections, and showcase the potential of trans-boundary cooperation. Dialogue & Education Programs: Participatory workshops and cross-cultural dialogues provide university students with unique intellectual experiences, deepening their understanding of the Nile ecosystem, and stimulating new ways of thinking, communicating, and doing. Leadership & Innovation Programs: The Nile Fellowship and Nile Prize programs incentivize university students to apply their education and training toward mobilizing their peers and pioneering innovative solutions to the Nile Basin’s complex and interrelated challenges. The Nile, one of the world’s most iconic rivers, has captivated the imagination of millions throughout time. Originating in two sources – Lake Victoria in East Africa and Lake Tana in the Ethiopian highlands – the 6,670-kilometer river flows northward through a diversity of climates, landscapes, and cultures before passing through Egypt and emptying into the Mediterranean Sea. Its 437 million inhabitants are projected to more than double within the next forty years, placing an ever increasing demand for Nile water; water that is tied to all aspects of life - from the food on tables to the electricity that powers homes to people’s health. Even now, people living along the Nile are vulnerable to water-related hardships. At least five nations in the Nile basin are facing water stress. Seven of the eleven Nile countries continue to suffer from undernourishment rates higher than 30%. Less than 10% of basin residents have access to electricity. The core issue at hand is how to peacefully allocate Nile Basin water among eleven nations with different needs and priorities, whose populations are all skyrocketing. This mounting resource scarcity has contributed to a geopolitical conflict between upstream and downstream riparian states. Tremendous political capital has been expended to draft the Nile Cooperative Framework Agreement, an international treaty to govern water distribution and infrastructure projects differently from the existing 1959 Egyptian-Sudanese treaty giving Egypt the majority water right annually. While the agreement has yet to win mutual consensus, the arduous negotiation process has exposed the deep-seated mistrust between countries, the absence of opportunities for citizen-led dialogue and the lack of a unified identity and vision for the future development of a shared Nile ecosystem. The Nile River Basin is wrought with political, environmental, economic, and social challenges requiring a new approach to better address the myriad challenges it faces. As regional tensions flare, the Nile Project offers a unique grassroots strategy to effectively mobilize thousands of people across the Nile Basin and beyond in constructive cross-cultural dialogue and collaboration. Mohamed Abouzekry: Despite his tender years, this oud player has a stunning command of his instrument, as well as an open ear for other forms, skills that got him a recent album deal with Harmonia Mundi. Alsarah: Based in Brooklyn, this soulful Sudanese singer and ethnomusicologist's songs have won high praise from roots-music tastemakers like Songlines Magazine. Michael Bazibu: A member of Uganda's leading traditional music and dance company, Ndere, for the past 17 years, Bazibu plays several traditional Ugandan stringed and percussion instruments with virtuosic grace. Hany Bedeir: When the biggest stars in the Middle East need daff (hand drum) or riq (traditional tambourine), they call Bedeir, whose percussion skills have also earned him a teaching position at several respected Cairo institutions. Nader Elshaer: Born in the culturally rich town of Port Said, Egypt, Elshaer taught himself accordion and ney, only to fall in love with the tones of the kawala (end-blown cane flute) and its role in Arabic classical music. Dina El Wedidi: With experience that spans Arabic classical music, edgy theater, and street protest, this young singer has most recently worked with Brazilian heavyweight Gilbert Gil on her debut album. Meklit Hadero (select appearances only): co-founder of the Nile Project, this American-based Ethiopian singer frequently digs deep into soul and hip hop, but never loses sight of her roots. Jorga Mesfin: This self-taught sax player meshes jazz with Ethiopia's wealth of musical forms and ideas, both as a respected band leader and favorite sideman for greats like Mulatu Astatke. Kasiva Mutua: Kenyan percussionist and singer Mutua may have learned drumming from her grandmother, but has developed her own knack for powerful Afropop beats. Her expressive playing can tell a story on its own, or keep a band perfectly in the pocket. Sophie Nzayisenga: The first female master of the Rwandan traditional zither (inanga), Nzayisenga learned at her internationally acclaimed father's knee before setting out to make the instrument her own. Dawit Seyoum: Known for his flexibility, Seyoum rocks both the krar and the bass krar, the six-string powerhouse harps at the heart of much of Ethiopia's music. Steven Sogo: Burundi's leading bassist, this multilingual multi-instrumentalist can play anything with strings, including the umiduri, Burundi's answer to the birembau. Add to that Sogo's wonderful voice, and it's easy to see why he was named a World Bank musical ambassador. Selamnesh Zemene: Hailing from a long line of unique culture bearers in Northern Ethiopia, this young singer has brought her traditions to collaborations with indie darlings like Debo Band and The Ex. Mina Girgis, President & CEO: An Egyptian ethnomusicologist with background in hospitality experience design, Mina explores new ways to cultivate environments conducive to learning, making, and experiencing music. He specializes in curating and producing innovative musical collaborations across diverse styles. Miles Jay, Musical Director: A contrabassist, composer, and arranger, Miles has worked with the likes of Youssou N’Dour, Ziad Rahbani, Fathy Salama, Ross Daly, Naseer Shamma, Niyaz, Mashrou3 Leila, and the Cairo Symphony Orchestra.